Where Can I Walk My Dog In The Park? Dogs are only welcome on the 3-mile paved multi-use bluff trail on the coastal side of Pacific Coast Highway, in parking lots, on the ramps, or on any paved surfaces. Dogs are not permitted on any of the backcountry hiking trails, on the beach, or at the Beachcomber Café. Your dog must be kept on a leash at all times while in the park. Leashed dogs are allowed in parking lots, the campground & other paved areas, provided that you control and clean up after your pet. Dogs are prohibited from backcountry trails and the beaches for the following reasons….. Dogs are predators by nature, and their presence or lingering scent will disturb and frighten wildlife nearby. Dogs can transmit diseases and other parasites to native animals. Dogs that run loose or become lost often harass or kill park wildlife. Some people are intimidated by dogs, even friendly ones. Dogs reduce the amount of wildlife that hikers are likely to see. Also, dog waste along trails and on the beach is a major nuisance to encounter and may contaminate the local water supply. Dogs in wild areas can be bitten by rattlesnakes, or other wildlife they happen to startle. Dogs frequently pick up ticks and are sometimes injured by toxic or thorny plants. If your dog comes in contact with poison oak, it can easily transfer the irritating oil to your skin. An unleashed dog can suffer painful or sometimes fatal falls. Park regulations, common courtesy and good judgment all require that you take special care when bringing your dog to a natural area. Alta Laguna Park North end of Alta Laguna Blvd. Laguna Beach West Ridge Trail only. Oso Creek Trail-Mission Viejo. Trailhead: From Interstate 5, take La Paz exit. Head NE towards Mission Viejo. At Marguerite turn right. Just past the shopping mall (Estanciero) and over the bridge, turn left into the trailhead parking lot. Quail Hill Community Park-35 Shady Canyon, Irvine (949)724-6814. Sand Canyon exit West side of 405 Freeway. Dana Point Harbor– (949) 496-6172 Dogs are permitted on paved walkways, but not on beach. Doheny State Beach-25300 Dan Point Harbor Dr. (949) 496-6172. Dogs are permitted on paved walkways, but not on beach. Strands Vista Park-PCH to Selva. Park in County Parking lot off Selva. (949) 248-3530. Talbert Nature Preserve-1298 Victoria Ave. Costa Mesa. (949) 923-2250. Corona Del Mar State Beach Dogs are allowed on the Corona Del Mar beach leashed during the day 6-10am and after 4:00pm. 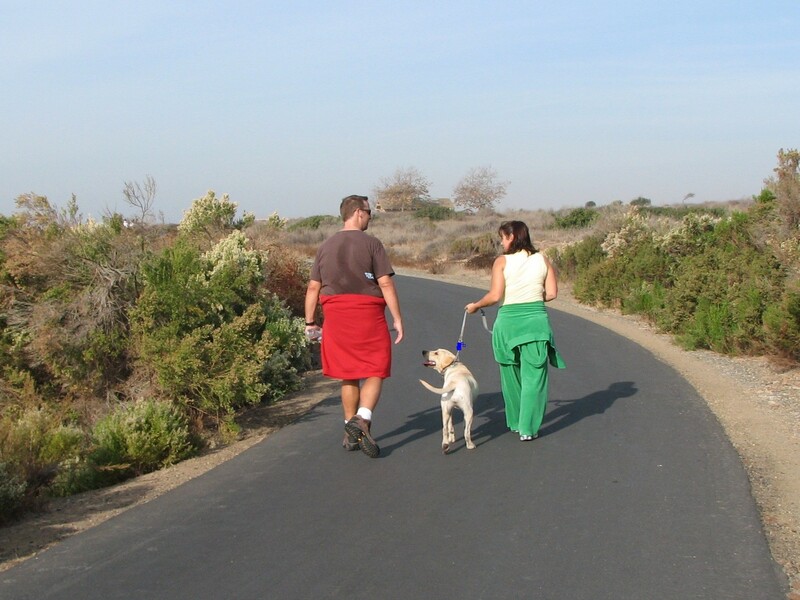 You and your dog can easily walk/run 1.72 miles, on the sand and pavement walkway. On the pavement walkway, there are many viewing spots with benches to rest. You have to stop at Inspiration Point and take in the view. Huntington Beach – Known as Surf City – A portion of the beach is designated for dogs. It starts at Golden West Street (21st Street) to Sea Point. It is known as the dog-friendliest beach in Orange County. It’s an off-leash beach and dogs can run, play, swim and surf. Just be cautious of the waves as it can be rough at times. Laguna Beach – Offers several dog-friendly beaches. From June 15th through September 10th, between 9:00 – 6:00 p.m., dogs are not allowed on any beach. Before 9:00 a.m. and after 6:00 p.m. dogs are allowed on the beach but must be on a leash. From September 11th through June 14th, dogs are allowed on the beach but must be on a leash. Newport Beach – Dogs are never allowed on the beach or any beachfront sidewalk between the hours of 10 a.m. and 4:30 p.m., including the ocean front beaches and bay front beaches.